This article is a short summary of Super Mario Galaxy 2. 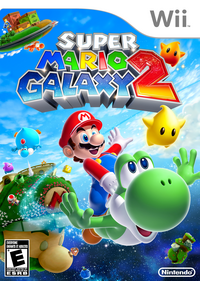 Super Mario Galaxy 2 is a 2010 follow-up to the original Super Mario Galaxy, released for the Wii in 2007. It is the first true sequel to a 3D Mario game, and the first 3D game to be released for the same console as its predecessor. The game was originally meant to be an expansion for the first game, originally going under the title Super Mario Galaxy 1.5, but it was later decided that the game would be a full sequel after Shigeru Miyamoto saw the game was being filled with new ideas. In all regions except North America, the game was also packaged with an instructional DVD that would teach new players how to play the game. The game was also the first Wii title to be re-released as a digital download on the Wii U Nintendo eShop. Mario and Yoshi blast off into a new Galactic Adventure! Play cooperatively in Co-star Mode! On the day of the Star Festival, Princess Peach has invited Mario to her castle to have cake and enjoy the festival together. As Mario arrives at the castle, however, he finds that a gigantic Bowser is attacking. Bowser reveals that he has taken Princess Peach, and flies off with her to the center of the universe. Mario chases him into space, and after collecting a Power Star is led to a starship. The captain, Lubba, reveals that Bowser attacked them and stole their Power Stars, and offers Mario his ship chase Bowser to the center of the universe on in exchange for collecting Power Stars to restore the ship's energy. When Mario accepts, Lubba uses the star to turn the ship into the Starship Mario and they head off toward Bowser's lair. The gameplay is largely similar to the previous installment. Galaxies are organized in a mission structure, in which players travel from planet to planet to collect the Power Star at the end. In this game, galaxies are organized into worlds, with a more linear world map. Players unlock new galaxies by clearing the ones in place, and occasionally have to have a certain number to progress. At the end of each world is a boss battle in which Mario obtains a Grand Star for winning, which allows him to access the next world. When not in a level, players can roam around the Starship Mario, a small hub area. The largest new addition to the game is Yoshi. As Yoshi, players can eat and swallow enemies by pointing at them with the Wii Remote cursor and Flutter Jump. Yoshi also has his own unique power-ups in the form of three fruits: the Dash Pepper, which makes Yoshi automatically run fast; the Blimp Berry, which inflates Yoshi and allows him to fly into the air; and the Bulb Berry, which makes Yoshi glow and reveals hidden platforms. In addition to the returning power-ups, the game also features two new power-ups for Mario: the Cloud Flower, which allows Mario to create up to three cloud platforms underneath himself; and the Rock Mushroom, which allows Mario to turn into a boulder and roll into enemies and obstacles. The game also features a two-player co-op mode, in which the second player controls an orange Luma. In addition to having a second cursor, the Luma can pick up items and objects and stun enemies. In addition, if players lose enough lives, they can receive help from the Cosmic Spirit, which will complete the level but give the player a Bronze Star.